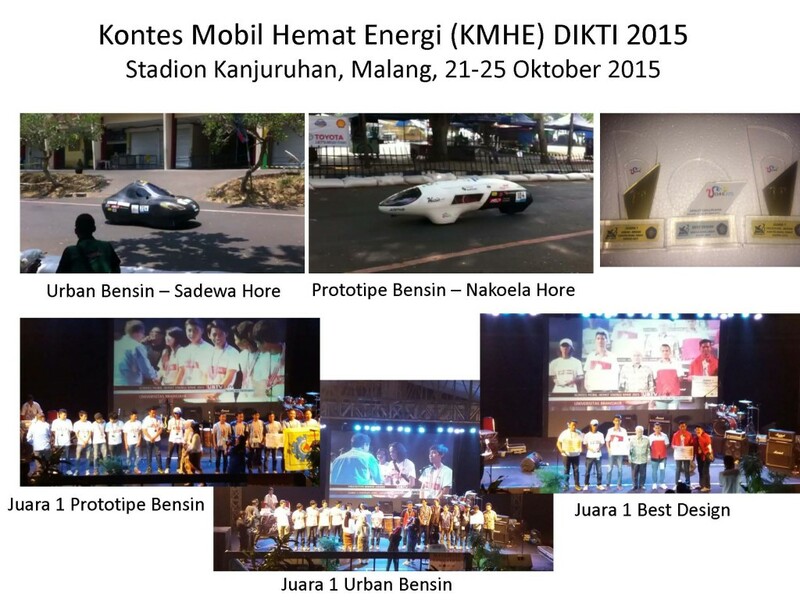 The UI Super-mileage Vehicle (UI-SMV) won three awards in the Competition for Energy Efficient Car Contest (KMHE) DIKTI 2015 in Kanjuruhan Stadium, Malang on 21-25 October 2015. Winner of Gasoline Fuel Urban Category for Sadewa Hore Team with achievement of 292 km/l. Winner of Gasoline Fuel Prototype Category for Nakoela Hore with achievement of 740 km/l. Winner for Best Design for Nakoela Hore. The UI-SMV team was supervised by Mohammad Adhitya, MSc., UI’s UI Student Reasoning Unit Head Anna Amalyah Agus, MBA and Competitio Judge Dr. Ario SB. This is the fourth competition, with the first three competitions held in ITS Surabaya. There are 62 cars competing for the KMHE 2015 out of 133 proposals submitted. The UI-SMV team is under the supervision of Prof. Bambang Sugiarto, Prof. Danardono and Mr. Mohammad Adhitya. The name Nakoela used by one of the team is a form of homage from the Department of Mechanical Engineering to Prof. Nakoela Soenarta who was one of the founding fathers of the Department of Mechanical Engineering and pioneered the development of automotive engineering in UI. This victory will help the team in preparing for the Shell Eco Marathon (SEM) Asia 2016 Competition which will be held in Manila on March 2016.